German made kitchens are synonymous with minimalist handleless design. But Pronorm make handless kitchens with a twist. The Y-Line adds a beautifully sculpted aluminium handle ledge to the door, drawer or pull out of each cabinet. This creates a different feel to the door and adds additional detail by allowing the aluminium to protrude slightly above the front panel. 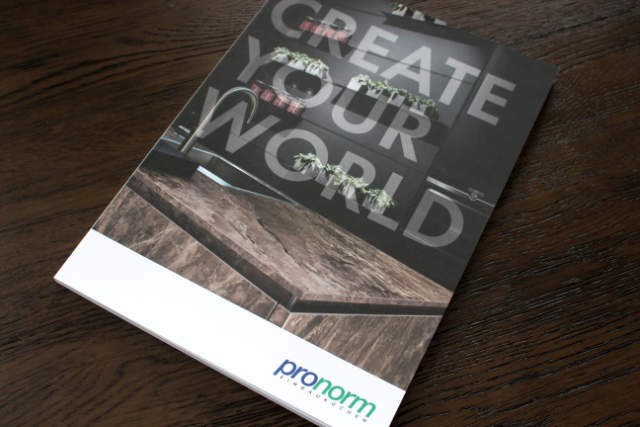 Y-Line is a different proposition to Pronorm's alternative handleless range. Where the X-Line uses a simple slab construction, the Y-Line presents a finer aesthetic. This adds some complexity to the construction. Each handle ledge is manually fitted by a skilled craftsperson in the Vlotho factory. It's a labour intensive process but it's totally worth the effort. The Y-Line kitchen is the ultimate in flexibility. Built along the same 128 mm grid system as the Proline 128, it can be mixed and matched with colours and styles to create something truly unique. With Pronorm's Y-Line kitchen you can create dazzling design elevations with floating base units in an array of sizes. Dare to be different and stand out from the crowd. The Y-Line kitchen is perfect for stylish symmetrical designs that look great, whilst offering high levels of functionality. The image below demonstrates a typical Y-Line cabinet set up. Tall larder units and pull out drawers in matt lacquer arctic white are complemented with a sliding "hideaway" panel and open shelving in natural oak.